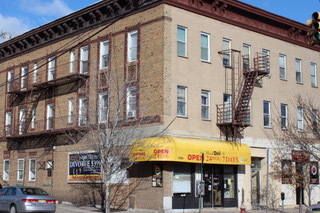 Located on prominent corner of Broadway and 52nd Street in Bayonne. Local businesses include Une Tasse Coffee Shop, Dominos Pizza, Walgreens, TD Bank, Investors Bank, Burger King, Broadway Diner, and AC Hardware. Glass front retail space of 660 sq ft with 11.5 ft ceilings and bathroom. Basement storage area of 760 sq ft with outside side street door access and internal staircase access. As is, needs work, great potential. Tenant pays utility and tax over base. Available now.